Republican Party, the New American Nazis? Republicans, the Party of Hate. What next? Brown shirts, Jack-boots and a hunt to cleanse “our White, Christian, Fatherland”? NO. I refuse to accept that ANYONE is out there, not supporting the hate platform of the Republican Party and still calls himself/herself a Republican. If you are a Republican, you are a party to the hate against Muslims and Islam, you are a party to the hate against Hispanics, Blacks, LGBTQ and everyone else that the party of “Grab ’em by the p***y” hates. 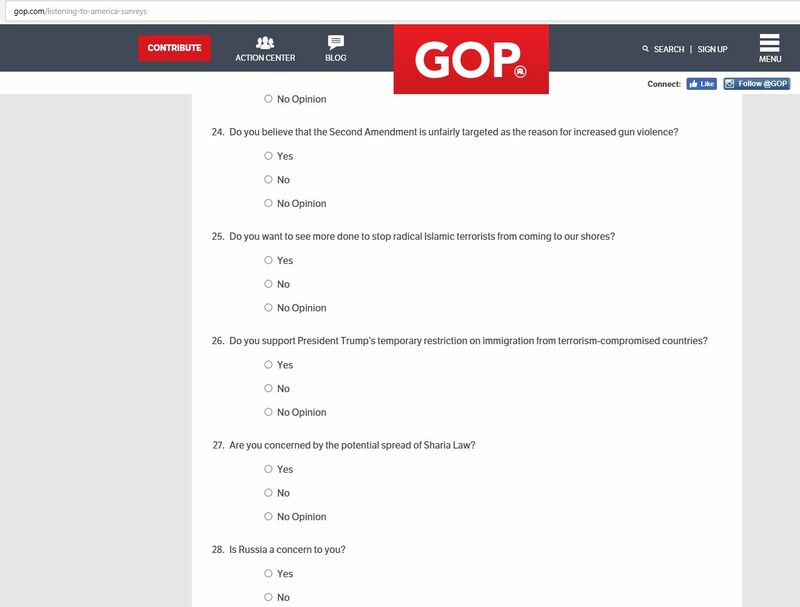 The GOP website “Listen to America” has a questionnaire online right now that focus hate against Muslims behind the ploy of “asking questions”, leading questions that they would not DARE ask about anyone other than about Muslims. “Radical Islamic Terrorists”! In almost any given year, Radical Christian Terrorists (sorry, Patriots) have killed more in the US than Muslims. Oh, and about slaughtering Americans, ask the Natives and the Blacks how many hundreds of thousands, how many MILLIONS have been killed just in the US but White Christians and then look at me and tell ma Islam is a problem. “Are you concerned about the potential (emphasis added) spread of Sharia Law”? Do these self-serving, bigoted numbskulls even understand what “Sharia Law” is do they even know that Sharia is NOT “law” and that it can be different from group to group? Whose Sharia and Whose spread? Exactly WHERE has “Sharia Law” spread to? I am not aware of a single state that says or is considering it will abandon the US constitution and adopt Sharia. What next, “Do you agree that the US must stop the oppression of Muslim women by Muslim men”? That sounds like a question that every unthinking idiot (and there are many) will nod and say “yes” to. I have friends who are Republicans, a couple of them are close friends too. Now I must ask myself, “What must my friends believe of me and people like me because of their support for Republican Party”? I am tired of people trying to tell me the party and Republicans as people are two different things. No, I’ll say this again, if you call yourself a Republican and if you support the Republican Party, then YOU also support Hate as an important part of being an American.